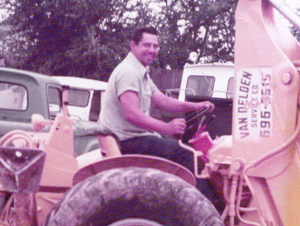 53 years ago, Alfonzo (Al) Pavlicek began working for my grandfather, Gary Van Delden at Van Delden Service Company. He was 19 years old then, and began as a helper installing septic systems. He’s worked for three generations of our family business, and after 53 years of dedication and loyalty, Al is retiring. 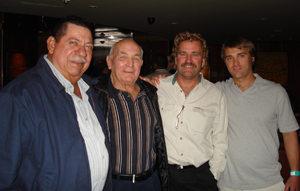 Al has worked through the many changes in the industry through his years of septic installations. Rock removal through many of his earlier years was done by jack hammering with air compressors and 120-lb jack hammers. Dynamite was used to accomplish this from the 1970s to the 1990s, when the use of hydraulic hammer attached to the backhoe became the new tool of the trade. The biggest changes Al witnessed was the evolution of septic systems. When he first began his career, the only kind of septic system that existed was the standard septic system; since then low pressure dosing septic systems, evapotranspiration systems, mounded systems and aerobic systems have been developed and introduced to the wastewater industry. Al has installed many of each septic system available today, but the one he liked most was the good ole standard system. Congratulations, Al — we’ll miss you! Over the years, Al became our #1 backhoe operator and installer — we estimate he has installed over 2,500 septic systems for Van Delden Wastewater Systems. He celebrated 50 years with us in 2010 with an article in San Antonio Construction News, and although he’s not sure what retirement will bring, he certainly hopes it involves fishing. Al, we will miss you — not just as an employee, but also as a friend. Pam, Courtney, Chad, myself, and the entire Van Delden team wish you a happy and relaxing retirement — you’ve earned it!